The SoundEar II Industrial Noise Activated Sign can be mounted on a wall or other vertical surface using a single screw or hook - like mounting a picture. The trigger sound level is set using a dial on the back. Especially useful in areas where the sound levels are not always high, it can be used to warn staff to take action to reduce their noise exposure. Yellow warning light indicates "getting loud"
Red warning light indicates "too loud"
The SoundEar II Industrial is designed for use in factories and other indoor industrial environments. It can be used to indicate to staff when the sound levels are getting high, prompting them to reduce the noise, leave the area or to fit hearing protection. 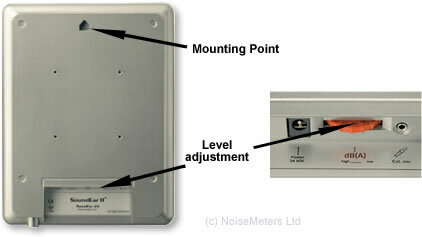 The noise limit can be set within the range of 40 to 115 dB(A), adjusted in 5 dB steps using the dial hidden on the back of the sign. The yellow lights warn when the level is getting close to the limit and the red light shows the limit has been exceeded. The SoundEar II Industrial can be installed in almost any indoor environment where employees need to be warned of high noise levels and to take action. As this noise warning sign is very easy to install, it is ideal for temporary and other short term noise measurement applications. 1. Set the sound level using the dial on the back. 2. Hang the sign on a single screw on the wall.